It is never too late to begin your fitness journey! It's February, and perhaps you're still contemplating a gym membership. Do not hesitate to get started. We have a couple of fantastic opportunities this month the help get you on your way to feeling fit and fabulous. We are offering you an opportunity to get started with a 50% discount on your enrollment. 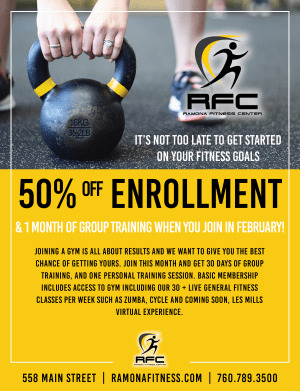 We are going to give you a full 30 days in a group training program, plus you'll get a free personal training session and more! We want you to be successful! Get started this month for only $49.50 plus your first gym dues are deferred for 30 days. By popular demand, we are bringing back Ramona's Biggest Winner. 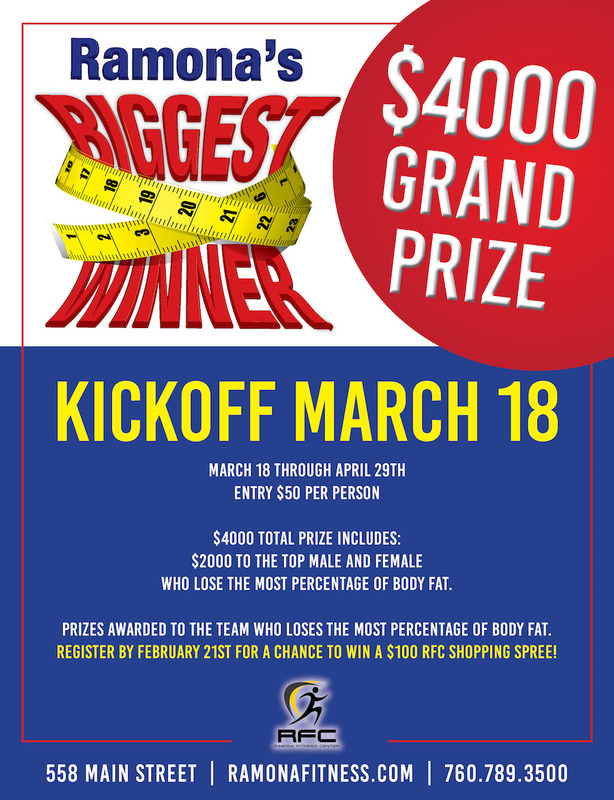 Peter San Nicolas, owner of Ramona Fitness Center created this fun and encouraging contest that has changed the lives of hundreds over the years. It is an awesome way to jump-start your fitness, enjoy the camaraderie of like-minded individuals and try new things that encourage a new lifestyle of fitness and good health. Create your team of 4, and compete for the title Ramona's Biggest Winner! Now is the perfect time to join in and get fit!